This luscious, comforting, ridiculously savory and delicious soup was prepped in advance, frozen, and made in a snap in the Instant Pot. Can you believe that? BELIEVE IT, kids. This is one of my all-time favorite freezer meals! 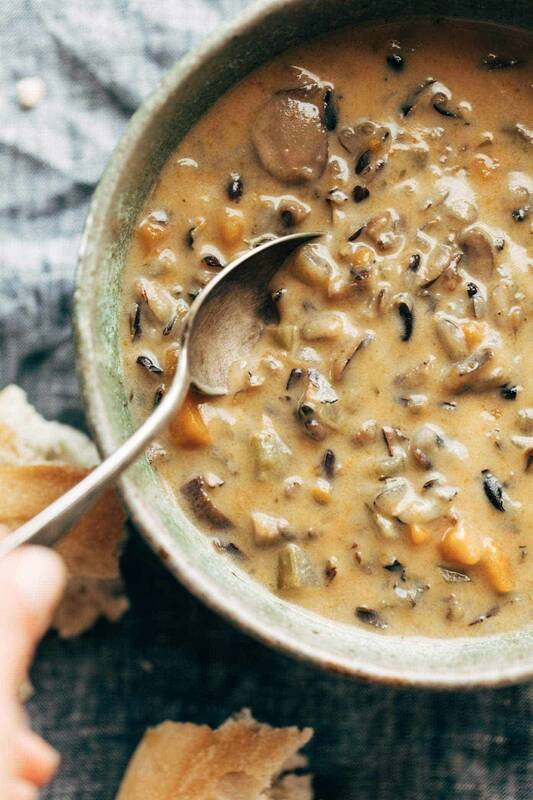 Freezer Meal Wild Rice Soup can be made with or without mushrooms (but strongly recommend using them for an irreplaceable earthy flavor) and with or without chicken (totally your call)! It starts with vegetables, wild rice, and spices, and then gets creamy when you add a simple roux to the brothy soup base. This is 100% a winter staple in our house. I have the recipe memorized. First things first – PLEASE USE REAL WILD RICE. None of this wild rice blend stuff. I know you are tempted, because it’s hard to find real wild rice (especially outside of Minnesota, where I am lucky enough to live) but it is very, very worth it to find the real stuff. Once you’ve located those pure black wild rice grains, you can freeze them together with your veggies and spices. Simple, simple. When it’s time to get your rice wild on, pop it into the Instant Pot! While it’s finishing up, you can whisk up your roux (sounds fancy – it’s just butter, flour, and milk to make a creamy sauce situation) and stir that roux into your soup. Voila. You will definitely need to eat this out of a very large bowl, both hands wrapped around, with a glass of Chardonnay, and a slice of hot uttered bread, while wearing comfy clothes and burning incense in the corner. Just kidding about the incense. Not kidding about the rest. Freezer Meal Wild Rice Soup! Just freeze in a bag and add to the Instant Pot. So creamy and simple. Perfect for fall/winter nights! INSTANT POT: From frozen, 30 minutes on high pressure + 10 minutes natural release. SLOW COOKER: From frozen, 4 hours on high. FINAL STEP: Melt butter, whisk in flour, whisk in milk until creamy and thick. Add to the soup. Add extra water to thin to desired consistency. Your recipes look delicious! I need 8-hour recipes (since I work away from home), so I’m wondering if 8 hours on low is the same as 4 hours on high. How long can this stay in the freezer before it’s made? Should be fine for 2-3 months! Nope – it can all go in raw! Why is the instant pot cook time (30 mins) less than your non frozen recipe that says 45 mins in instant pot? Is this a mistake? I would think frozen would need to cook same ant of time if not longer (not less)….I have the freezer meal ready to go, just want to make sure cook time is correct. Thank you! Do you add the chicken broth when you freeze this or add it when you put it in insta pot? Hi, may I cook it then freeze it? Will the texture/taste be okay? Wanted to make just heat up meals without any cooking. I was wondering the same thing! 🙂 If I can just make it in advance and then freeze it. I usually cook from scratch if I can but need to save myself time by doing meal prep. Scared about compromising the flavours. I want to make this for my daughter about ready to have a baby. Looks so delicious. Yes, totally possible that it’s the brown rice. You could add more broth to thin it out! Just wondering what to do with the chicken? Do you cube it, put in whole and shred once cooked? We put it in whole and shred after it’s cooked! This looks great! How could you cook it (fresh or frozen) in a regular pot? We don’t have an instant pot or a crockpot. This is soooo delicious. I added 3/4 cup of dry white wine since the rice needed a little more liquid and it was one of the best soups I’ve ever had!